Meet my new bag baby, 'Betty'. I'd point one of my four white-gloved fingers (Minnie Mouse-style) at that excuse beloved of women approaching the big 3-0 crisis - "I'm regressing and experiencing the coming of a second childhood!" - but as mummy dearest points out: I never really grew out of the first. 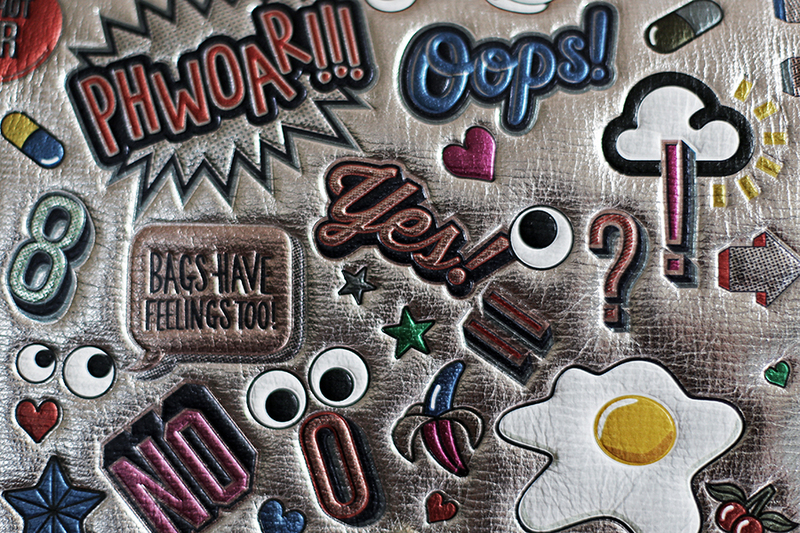 That's her thought process when she bought me this satchel from Anya Hindmarch's schoolgirl-inspired collection adorned with their hit customisable stickers, and probably why she sent me a passive-aggressive WhatsApp picture of the sticker 'Bags Have Feelings Too' (yes, I'm notoriously ham-handed with luxury goods - I blame it on my hyperactivity and my excessive sugar consumption). Perpetual ice-cream covered mitts aside, don't you just want to finger Betty? Oops, that came out so wrong... Betty is my fond moniker for my new baby (I name all my handbags because purses make such great imaginary friends - tell me you also talk to your bags when no-one is looking? 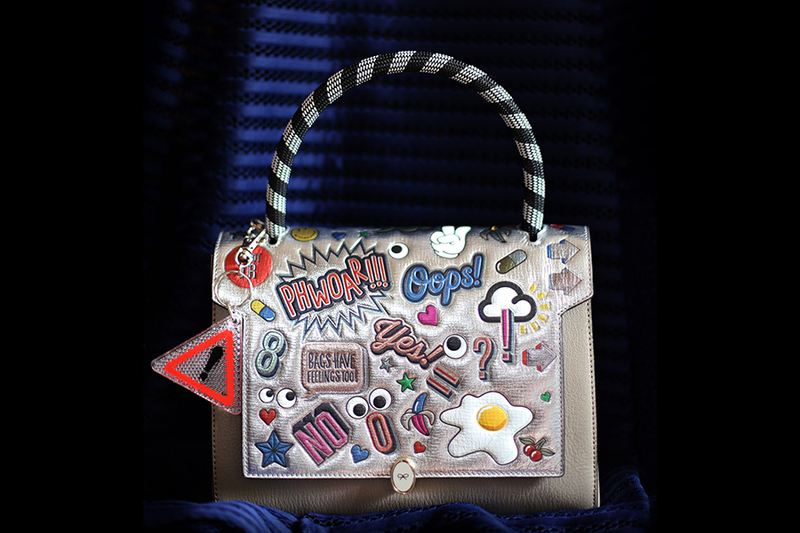 ): the Bathurst satchel by Anya Hindmarch. Betty made her debut on Halloween at the Malaysia Tatler Ball, and she'll be taking her first trip abroad tomorrow morning in Seoul. She may not be generous enough to accommodate my new Canon 6D - once you go full-frame you never go back: my Olympus Pen and Lumix GF-6? Relegated to the Micro 4/3 section of my collection of cameras past - but I've manage to fit, Tetris-Style; my new Hermes purse with wads of Korean Won (oh God, the currency is so hard to get my head around...why the huge denominations? ), my recently-upgraded iPhone 6+, a marble and copper- print notebook, Horrible Histories pencil case, makeup, and business cards. The bare essentials but for the huge DSLR hanging off my shoulder. 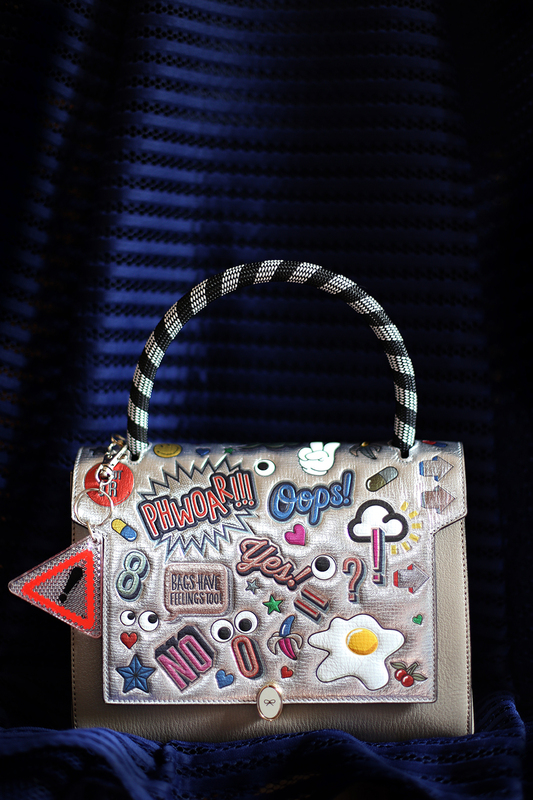 What do you think of the new Anya Hindmarch collection? Will you be sticking around, or is it too childish for you (boo, spoilsport! )?